When Nike first launched the Nike+ system many saw it as something of a gimmick rather than a serious training tool. The ability to track your speed and distance using the Nike+ Foot Pod and your iPod nano was fun, but not ideal for the serious runner. Over the past twelve months the Nike+ system has evolved with the iPhone GPS app, and more recently the Polar Nike+ enabled WearLink heart rate sensor. But this week a new product was announced that has taken the Nike+ system to the next level. 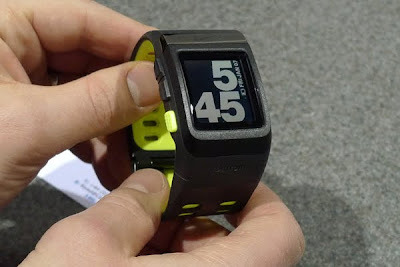 The Nike+ SportWatch GPS is the result of a collaboration between Nike and GPS masters TomTom. 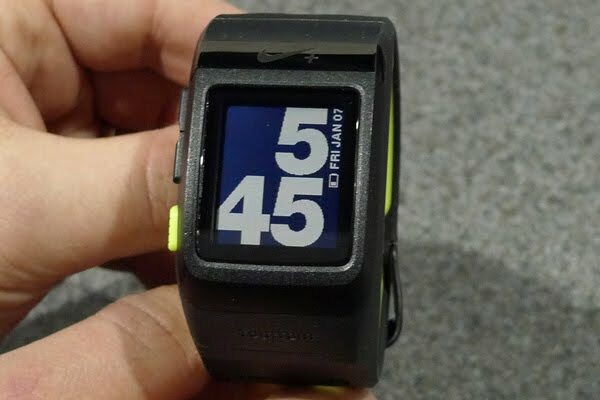 The Nike+ SportWatch GPS announcement comes as part of the Consumer Electronics Show in Las Vegas, and of course FitTechnica is here at the show. This morning I spent some time with the folks at TomTom, but more importantly, I spent some time with the Nike+ SportWatch GPS. First up, the Nike+ SportWatch GPS is a great looking piece of kit, probably the best looking sports watch I’ve ever worn. There’s a two tone finish with black on the outside and a bright yellow on the inside of both the watch and strap. The strap itself has holes running along its entire length, so finding a comfortable fit won’t be a problem whatever size your wrist may be. There are three buttons on the left hand edge of the Nike+ SportWatch GPS, two finished in black and one in the same contrasting yellow. The two black buttons navigate up and down through menus, while the yellow button will select options. If you’re disappointed that there’s no front mounted button for easy lapping duties, don’t be. 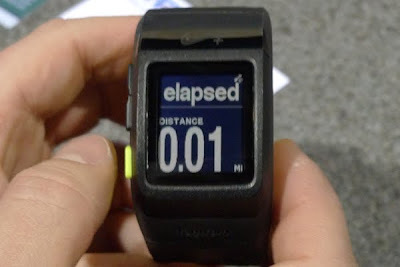 While you’re running you can simply tap the front of the watch and it will start a new lap. Talking of lapping, you can also set the watch to auto-lap on a set distance, but it won’t auto lap on position. Tapping the watch will also activate the backlight. There are two display areas on the Nike+ SportWatch GPS. The main display is very large, making it easy to read even when under heavy exertion. 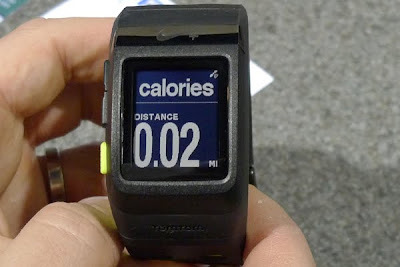 The secondary display runs across the top of the screen and can be configured to show time of day, pace, elapsed time or calories burned. The main display defaults to distance. Anyone who’s used a footpod or stride sensor will know that there are accuracy issues. Of course most systems that use a footpod will let you calibrate them by running a set distance during configuration. However that still won’t ensure completely accurate readings over changing terrain since most runners will alter the length of their stride as they run. The Nike+ SportWatch GPS doesn’t suffer from that footpod inaccuracy, since it takes readings from both the internal GPS receiver and the footpod, using both sets of data to ensure complete accuracy. So, if you happen to run through a dense forest, or through an underpass, data from your run will continue to be captured via the footpod, and any changes in your stride length will be corrected by the GPS data. The other great thing about having two types of speed and distance sensors is that you can get running straight away. With GPS systems you have to wait for a satellite lock before you can set off. That usually means leaving your watch on a window sill while you get ready, if you’re organised. If you’re not organised, it generally means standing around for a few minutes when you’re ready to go, waiting for that lock. 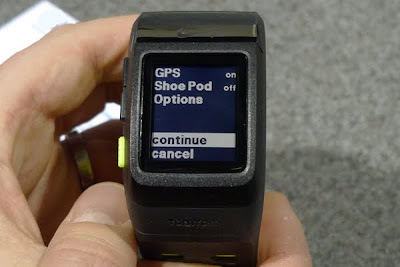 That’s simply not a problem with the Nike+ SportWatch GPS, because you can get going with the watch taking readings from the footpod, then it will add the GPS data to the equation once the satellites come online. The Nike+ SportWatch GPS is compatible with the Polar WearLink+ hear rate monitor, so it can also record your heart rate during your run, giving you even more data to work with from your training sessions. The Polar HRM doesn’t come bundled with the watch, but the Nike+ footpod does. There’s both Nike and TomTom branding on the device, which is good since it’s clear that a great deal of TomTom’s user interface experience has gone into the design. 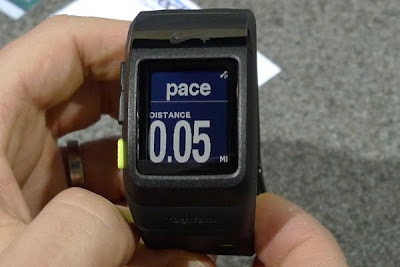 Configuring the Nike+ SportWatch GPS is incredibly simple. The main menu has options for setting the watch, configuring your run options, viewing your run history and records. The watch will store your last 50 runs, but it will also store your records. 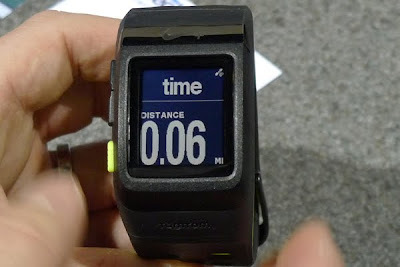 So, it will keep track of your best time for a set distance, or the furthest you have ever run. 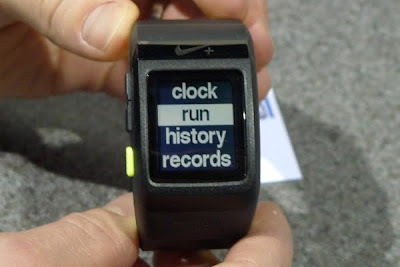 By keeping these records stored, the Nike+ SportWatch GPS will keep you motivated by congratulating you whenever you beat one of your records. You’ll also receive an alert if you haven’t gone for a run for a while, just to give you a little push. TomTom estimates that you’ll get between eight and nine hours battery life with both the GPS and footpod sensors in use. Obviously that battery life can be extended if you use only the footpod, so if you’re training in the gym on a treadmill, you can switch off the GPS and save some juice. To get the most out of the Nike+ SportWatch GPS you can upload your data to the nikeplus.com web portal. 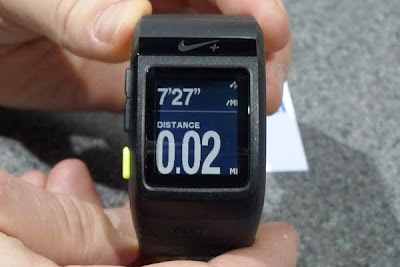 The data is uploaded by connecting the watch to a computer, whereby Nike+ application will automatically transfer your data to the website. Connecting the watch to your computer is simplicity itself, since there’s a USB connector built right into the strap – fold back the buckle and the USB contacts are revealed. There’s a USB extension cable bundled in the box in case your computer’s USB ports are hard to get to. 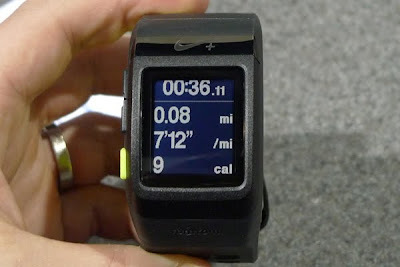 And despite the fact that there’s a USB port built into the strap, the Nike+ SportWatch GPS is still fully waterproof. There’s no UK pricing for the Nike+ SportWatch GPS yet, but a launch date of the 1st April has been confirmed. We’ll be badgering TomTom and Nike for a review sample as soon as we’re back in the UK, so check back for a full review soon.